Invalid certificate messages when accessing email? Do you configure my shopping cart for ssl? Certificate good for all sites on server? Which type of Comodo SSL certificate? Expired SSL warning even after new ssl installed? SSL certificate solve phishing warning? How to tell if SSL is installed? How to force website to use ssl? For more information about SSL certificates and when you might need one for your website, please see our article: What is SSL and why is it important? Please note, the following information is for customers purchasing an SSL through InMotion Hosting. If you have (or will be ordering) an SSL from a separate (third party) SSL vendor, please see our article on requesting installation of a third party SSL. Free SSL provides viewers with a a secure connection and the reassuring green padlock without a self-signed error. It suffices for blogs and informational websites. However, major businesses and e-commerce store owners should consider a dedicated SSL. There are different Free SSL installation procedures for shared, reseller, and VPS accounts. They automatically renew every three months. Note:Before switching betwween a Free SSL and dedicated SSL you may need to remove older SSL's using the cPanel SSL/TLS section. You can read more in our detailed article explaining differences between Free SSL and paid SSL certificates. If you are on a shared server (business class hosting), you will have access to the shared SSL certificate on the server. To access this, you can create https links in your website files that use the secure server name. The secure server name is always 'secure##', with ## being the number of your server. Your server number is listed in your account's technical details in AMP. Please note that the above URL will be visible when visitors hover over links on your website. For more information specifically on Shared SSL certificates, please see our article on How does the shared SSL work?. To have the SSL certificate installed, your domain WHOIS information must match the information for the SSL certificate. SSL certificate requests sent to our certificate provider that have mismatching information will NOT be processed. After completing the SSL installation, our support team will send you an email with more information. Click here to learn more about Dedicated Hosting. Our Dedicated SSL certificates are 256-bit encrypted Comodo SSL certificates and are only $99.99 per year. There is also a one-time $25 installation fee for all SSL certificates. Login to AMP (Account Management Panel). Click the Purchase a Dedicated SSL Certificate button. On the next screen, select the SSL Certificate's subscription length (i.e. 1 or 2 years). Also enter the Desired Certificate Name. Generally www. is the most common certificate names, followed by the domain name. For example, a certificate for our website would read www.inmotionhosting.com. When you are done click Next. Enter valid contact information for the owner, or business the SSL certificate is for. Finally, after hitting Next you can choose how you want the SSL billed. Once you have completed the form, click Submit, you will then see a message stating "Your order has been submitted for processing. Please look for a follow up from our staff shortly." How Long before the SSL is installed? Typical turn-around time is up to 48 hours, but there are many reasons why an SSL may take longer to be issued. If this SSL is critical for your business, I recommend allotting up to 2 weeks for this process, in case you run into any issues. How Do I Know When the SSL Installation is Complete? Tech Support will send you an email immediately after installing your SSL successfully. The email will go to your primary email address on file, which you can update in AMP. 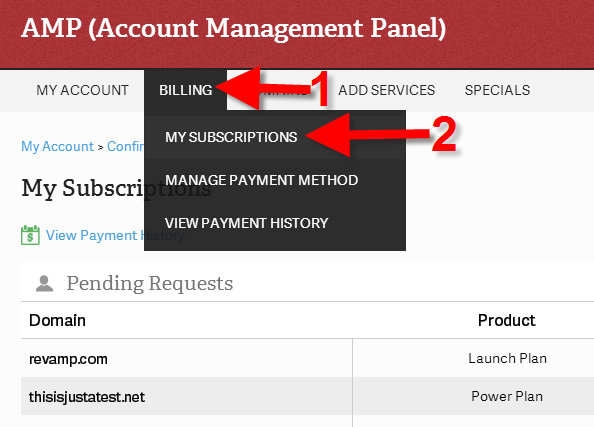 In the main menu, move your mouse over the Billing option, and click My Subscriptions. Find your SSL on the My Subscriptions page, and click the "X" to the right. Confirm you want to cancel the SSL on the next screen by clicking the Submit button. You will then see a message stating "You have cancelled your SSL subscription." How Can I Secure My Site? problem with media URLs after SSL installed. I am paying the SSl certificate since two years ago, however this it is not installed because it shows me a message that "This website it is not secure". Also, how can i access to a secure email on this same website? The SSL checker tool can help you verify if an SSL is installed successfully. Also, the Why No Padlock tool will tell you why your site is not secured. I'm experiencing a gray padlock with orange triangle for my website within Mozilla with the message: Connection is Not Secure. I get similar result with Google Chrome, the message says: Your Connection to This Site is Not Fully Secure. How do I reolve this? If you're seeing that, then not everything on your website is secure. You would need to fine any URLs that are being used on your page and change them to use the secure URL. In the case of any graphics or scripts referenced outside of your site, you would either need to have a secure URL for those items, or move them to your site so that you can use an HTTPS URL for them. If you need help finding why your site is not secure you can use this free service: Why No Padlock? It will show you what's not secure on your page. If you require help with your website code, then you may need to speak with an experienced website developer. The process varies per hosting plan - VPS or Reseller. However, FreeSSL isn't available for LD servers. I apologize for any inconvenience. Note: CSR code has been created to help you secure SSL Certificate. It means that your hosting company is the one that should generate CSR code upon your request. You need to contact your host to create a CSR from the server where your website files reside. Once you have the CSR you will need to provide that to the entity you purchased the certificate from, to have them rekey the certificate with the correct CSR from the server. I hope this helps! The website url is leighbrownleeart.com and I just bought the domain and certificate today. Can you please help to resolve? Sorry for the issues with the SSL certificate. I checked your site with an SSL certificate checking site (https://www.sslshopper.com/ssl-checker.html#hostname=leighbrownleeart.com) and also by looking at how my browser looks at your site. When i pull it up, in Firefox, the site shows as secure with no warnings and a green lock icon. Make sure that you have cleared your internet browser cache. This will often have an old copy of the site stored for quick access. If you continue to have problems, please contact our live technical support team via email/phone/chat. I purchased dedicated SSL, but Chrome still occassionally shows my SSL as having an invalid certificate and saying the site is not secure. This is probably causing me to lose website visitors. What can I do? The SSL certificate cannot be secure and insecure, it will be one or the other. If you are seeing it as insecure sometimes you are most likely getting a content warning because you have resources being called from external sources via http instead of https. If you have an insecure page open in chrome and right click and click inspect you will see entries in the console for mixed content or insecure URLs or endpoints, Those will need to be changed to be https for those pages to show as secure. Alternatively, you could be seeing this message if your domain is pointing to multiple servers, one with a valid certificate and one without a valid certificate and you would only see the warning when the browser chooses to go to the server with the invalid certificate. I have my web hosting here, but have two subdomains at an ecommerce site elsewhere. Is it possible to have my SSL cert here cover just certain subdomains but not those specific ones, as I will need to have a separate SSL for them? Also, if I add additional subdomains will I need to do anything special to make sure they are covered under the pertinant SSL? Will it matter if I have a wildcard cert if I have them covered here and there? My ecommerce site requires a CNAME set to them. Is that something that you can do or can you direct me to a location to do it myself? Yes, you should install the separate SSL's on the server hosting the subdomains. Here is a helpful link to our guide on creating a cname record. I just purchased a VPS plan and am wondering about a UCC SSL certificate. I would like to install one and have it protect the seveal sites I plan to transfer to the new InMotion VPS server I bought. How do I purchase and install a UCC SSL certificate? InMotion Hosting offers a Free SSL Certificate. However you can purchase an SSL from a third party, since InMotion does not offer a UCC SSL and install it. Q: How do we pass the DCV? Ifs it going to send an email to each domain? like Admin@domain.com? So, do I need to set up Admin@ on every domain and have them forward back to me so I can validate? My clients would not have any idea what was going on so I need to do this. There is no additional configuration or emails needed for Domain Control Validation. All you need to do is ensure that the domains that are going to be protected by the SSL(s) are pointed to the InMotion Hosting name servers and DNS records are all pointed to your server. The process of validation is done automatically as long as your domains are pointed properly. Hello, I purchased my SSL Certificate though Inmotion. However when I visit my site https://www.newdirectionstravel.org I get the message "This connection is not private. This website may be impersonating "www.newdirectionstravel.org" to steal your personal or financial information." I checked my SSL on www.whynopadlock.com and it said "Your SSL certificate does not match your domain name! I am thinking of subscribing to your $29.99 month VPS deal (VPS-1000HA-S). I have two sites that will be hosted, which at some point I would to use SSL. SSL certificates are specific to a domain name. So, if your 2 sites are using different domain names, then you will need to get separate SSL certificates. If you aren't doing something that requires a more secure certificate and insurance (which SSL providers typically provide), then you can also use the free SSL certificates that are issued by cPanel. We do not recommend using the free SSL if you're performing transactions that involve payment. I hope this helps to answer your question, please let us know if you require any further assistance. I am trying to get PayPal USA module working on my site. I created the fre SSL certificate InMotion offered but I can't seem to get PayPal USA to work. I tested my ssl site and got this message. What am I doing wrong? ERROR: The secure URL you submitted was redirected to:http://bitchvilleandcompany.com/shop/index.php? Please try pasting the secure URL you originally submitted into a new web browser window to make sure it stays on the secure page. Your secure page may require there to be items in a shopping cart, or for the user to be logged in. It may not be possible to test this URL. The certificate shows as being valid. If the software is refusing the URL, then you may need to speak with Paypal's support to determine what is failing. Apologies that we can't provide an immediate resolution. If you just added the certificate, then it's possible that you may have needed to wait for propagation to complete. Test it again, and then if the error recurs, please contact Paypal for further assistance. We're on a SHARED server plan. Out of the 3 websites, 1 is buit on wordpress (The wordpress domian name is NOT the main domain. It's an add-on). I would like the WordPress Dashboard login to be secured. So I would like to purchase a SSL certificate and install the SSL certificate to the WordPress dashboard login page. The end-users would have to log ito the dashboardn using https://mydomainname.com/wp-admin. 1.) Term Length: 1 Year - Can I purchase for 2 years? 2.) Certificate Name: mydomainname.com (without the www) - Is that correct? 3.) By purchasing the SSL certificate, including the $25 fee for installtion - How long will it takes to retreve a dedicated ip address? 4.) Will my add-on domain name (WordPress Website) be down after the purchase of the SSL certificate or will the website be down after you issue me the dedicated ip address? It should be emphasized that SSL does not protect the login screen. You will want to investigate an option like Sucuri in order to protect your site. For the SSL, we only sell the one year term. However, you have the option of purchasing a longer term SSL from a third party vendor and having us do the $25 install. I have a VPS and should have 3 IPs with it. Can I use one of the IP for the SSL? And if I buy SSL from soebody else I suppose this $ 25 insatllation fee is just for once, not every year. Yes, you can use your extra IP for an SSL. And, yes, the installation fee is a one time charge. 1) If I order via the AMP screen where it says "Purchase SSL Certificate", where do I tell it what domain I want the SSL to be on? 3) Inmotion would then charge $25 for the install, plus $2/month for the dedicated IP for that domain, plus $99 for the SSL for one year, correct? 4) When it's done and installed, will this SSL have the green lock bar (the EV SSL)? Or, would I need to go 3rd party go get that? 5) What are the renewal costs, and how does that process work? 1. In Step 3 you should enter the domain as the "Desired Certificate Name." 2. You should enter the URL that the site uses. For example, you should choose if you want your site display the www or not. But, keep in mind the SSL will work for the domain with or without the www. This is not a wildcard SSL. 3. Yes, the $25 fee is only for the initial install, and the IP address is included in the $99 dollars. So, you will pay $99 plus $25 for the first setup. Then just the $99 for the renewal next year going forward. 4. You would need a 3rd party SSL for he green EV bar, since we do not offer it at this time. But we will hopefully be offering this option soon. 5. You will pay $99 per year for the SSL going forward. We install SSLs with SHA2 encryption. If you require something different, you can purchase a third party SSL that meets your exact specifications and we can install it for a $25 one time fee. May have the jargon wrong but here goes: My domain is registerd with inmotion but my site is on Wix. I am impelennting a forum on my site so want to have https & ssl. Are they the same? Can I just buy an ssl from inmoiton and be done? If your site is hosted by Wix, they will need to install the SSL in their server. Once the SSL is installed, the domain will be available on the https:// protocol. I want to use Let's Encrypt on my websites and I just signed up here with IMH and hope to get the right answer on this because it's so important: Do you offer Let's Encrypt support? At this time you can only install the Let's Encrypt service on VPS, or Dedicated server acounts. Alternately, you can install a let's encrypt ssl if it it keyed by a 3rd party, just like installing any 3rd party ssl. How to transfer an SSL to a new host, keeping same domain name? You will have to re-key the SSL by requesting a new CSR from the new host. How do I use a SSL certificate which is purchased on InMotionHosting on my dedicated server which is with another hosting provider? Is it possible? It is certainly possible. You will need to have the SSL rekeyed for the new server. To do that, have the new server's host create a CSR and then send it to InMotion Support department where we can have it keyed for the new server. Then, we will have the files sent to you and it can be installed on the other server. Hi there! Just to make it clear: what should I specify in "Certificate Name" field my site to work properly with and without "www"? "*.site.com" or "www.site.com"? Now I redirect www version to the non-www version via .htaccess. Thank you. For the certificate name be sure to use the domain name (www or non-www) that you want to use for the SSL. You are not required to use www and redirect later. You can use the non-www for the certificate itself if you want. will protect all my sites or just one page ? SSL protect my sites from hackers ? An SSL will encrypt the transfer of data from your site to the visitor. It protects against data sniffing, but not hacking. It will also not clean your site after a hack. How clean the my site after hacked, i dont need a developer to check the site will be automatically ? I have domain on inmotionhosting and see on google, this my domain a subdomains i dont created, i use wordpress on that site i checked there but dont find the subdomains. You can have your website scanned for malware or request that the site be scanned through our live technical support team. Otherwise, it is best to have a developer your site for security problems. In regards to finding your subdomains on Google, you will still need to make sure that subdomains are created in cPanel and then properly optimized for search engines. Creating a site does not automatically place it into a search engine. See this tutorial on getting our site in to search engines for further information. I have just moved my files from my old host and I want to get SSL for it. Also, I have hosted a brand new blog here. So, what should I do to get the SSL for both the blogs? An in-depth reply will be much appreciated! The information you are seeking is detailed in the article above. Please refer to the AMP section on ordering SSLs. Remember that if you're using separate URLs for both domains, then you will need to use different SSL certificates - they are URL specific. is the certificate Comodo EV (Extended Validation) SSL with green bar? Yes, I got it all fixed. Thanks. An unknown response null: :text/html; charset=utf-8: :SyntaxError: JSON.parse: unexpected character at line 1 column 1 of the JSON data was received while processing an ajax call. The action you requested could not be completed. Your support confirmed the correct installation of the certificate they say, however, I thought I would check with you guys to see if anyone has run into this and might know what is causing the error. Any help from anyone is appreciated. I didn't learn why from whynopadlock.com either, other than I need to make the error pages relative. Have you modified the configuration files to allow the SSL? Here is an article on how to setup the dedicated SSL on Zen Cart. How to update website URL. I have activated SSL on my website. I want to transfer all traffic from http:// to https:// For example from http://domain.com to https://domain.com. We have written an article on how to force the SSL via the .htaccess file. If you still need assistance please feel free to ask. Why would I choose to purchase an SSL certificate from a third-party when I can purchase it from InMotion Hosting? Will the SSL certificate generate a new URL for my website, so I will need to set up a sitewide 301 redirect? There are different types of SSLs, so if someone wanted one of the types we do not provide, they would need a third party SSL. Adding an SSL to your site does not change the URL, to access the site via the secure protocol, just change the http:// to https://. The only reason you would need a 301 redirect for that would be if you want to force the https version. I got free SSL Certificate for my website from Comodo (https://ssl.comodo.com/free-ssl-certificate.php). How to install this SSL Certificate to my domain? To have the SSL installed, just follow our instructions for third party SSL installation. I am migrating to "pro" plan from another hosting company. I already have dedicated SSL certificate for mail.mydomain.com. Can I install it (or have it installed), so that my email is secured/encrypted with this certificate, as opposed to with a shared certificate? Sorry for the problem the certificate. You should be able to have the certificate re-keyed for its new location. You may need to speak with the SSL certificate vendor from whom you originally purchased the SSL certificate to have this done. I hope that helps to answer your question! If you require further assistance, please let us know! I've purchased my certificate through PositiveSSL and used CPanel's SSL/TLS Manager to install it. Although I've followed all the instructions and the key is clearly shown as installed, I can't seem to get an https access. Would you please check on that? This would be an account specific issue. If you are one of our customers, you will need to contact our Live Support for additional assistance. If I have one domain with three subdomains (www1, www2 and www3.mydomain.com), running on one IP, and I need SSL on all of the three subdomains, do I need two additional IPs? If yes, how do I get the two IPs? If you're talking about separate add-on domains, then each would require a separate SSL and IP address. Note that this is only possible on VPS or Dedicated server accounts. I am hosting a website on inmotion but the domain name is registered from a different provider. The domain does point to inmotionhosting. But my account shows a differnt domain. When I purchase a certificate i want it for the domain which is pointing from other location and not the one on my account. When you purchase an SSL, you get to specify which domain you want it to be for. We do not have to be the registrar in order for you to purchase an SSL for a domain. I am transferring my website, which has a SSL registration. Does it transfer with the domain or do I need to request it? Thank you for contacting us. You will need to transfer the ssl separately. Here is a link to a similar question we answered, where we provide additional details. in installation process of ssl certificate in cpanel which step is first download ssl certificate or genrate key and all steps? can anyone explain for installation of ssl certificate in cpanel which step is first purchase ssl certificate or genrate private key and all steps? where to purchase ssl certificate in cpanel? I put both of your posts together in one post to answer your questions. You actually can purchase the SSL certificate through AMP - not through cPanel. Additionally, in order to properly install the SSL certificate, you would need to have access to WHM. Check out this article for more information about installing SSL. If you are on a business account (shared server), then you would need to submit a support ticket to have the SSL certificate installed. Yes you can order a dedicated SSL to be used on your domain instead of using the shared SSL. Thank you for contacting us. We are happy to help, but will need to know the domain name to investigate further. You can also reply to emails from Live Support, to open a ticket with them. Sorry for the confusion about the SSL certificate. This particular domain name is assigned to a VPS account. SSL certificates are not provided for VPS accounts by default. You would have to purchase it, and keep the certificate up-to-date. For more information on maintaining a VPS, check out this article. We are getting messages that the certificate for internet security issued by inmotionhosting is out of date. This happened last year and I took 3 month for you to finally issue an updated certificate. Please don’t let it take so long this year. Can you provide us with the url that is showing this error so we may take care of it as soon as possible. Hi there, I've purchased your Business Class Premium product which states it will run: 6 Separate Web Sites, up to 26 domains with email, and 50 MySQL Databases. For each of these sites I need the web page encrypted with SSL. From what I'm reading on this thread it would not be possible to have SSL on more than one web site simultaneously as it is stated only one SSL certificate per cpanel account and the limitations of SSL are that there must be a separate certificate per domain/site. Can you please confirm as it appears I may need to look at different options. Thanks. Thank you for your question. Yes, you will need a separate cPanel for each individual SSL certificate. You may want to consider a Reseller, or VPS account, which would allow you to have a separate cPanel & SSL for each account. This is particularly important since Google now discriminates against non SSL protected websites. And I assume in the future, SSL will be a requirement for all websites. If the Pro Shared Business Hosting Plan only allows one SSL protected website, that is a serious limitation of the Plan since it makes the Pro Shared plan no better than the much lesss expensive Launch plan. 2) Is obtaining an SSL for each of multiple websites easier if NameCheap.com or other domain name registrar handles the domain name instead of In Motion Hosting? This is because this may bypass In Motion Hosting's limitation of limiting SSL to only the primary domain (the domain that has the cPanel). The easiest way to provide SSL's for your websites is to use the Free SSL that we offer. You can install multiple SSL's within a single cPanel. It does not make any difference where your domain is registered. I need to install a Stripe check out on one of my subdomain sites and SSL is required. Can you tell me which of your SSL certificate products would work with Stripe? We only have a single SSL certificate product that we resell. That will work with Stripe just fine. All SSLs use the same protocol to connect. The difference in the certificates is the level of vetting that the purchaser pays for. Combo SSL is 99$(including dedicated IP and install fee) per year. I found cheap RapidSSL by Geotrust taht is 10$ per year. If I want to user RapidSSL,that cost 25$+2$x12months+10$ per year? Thank you for your question. SSL certificates require a dedicated IP address at a cost of $2.00 per month, billed yearly for $24.00. With all SSL certificates (ordered through us or through a third party vendor) there is a one-time $25 installation fee. To use a 3rd Party SSL, you will need to Request a CSR from AMP. 1.- is it possible to install a ssl certificate into your launch plan? Thank you for your question about hosting a domain, and SSL. Yes, you can install an SSL with with a Launch Hosting Plan. I recommend signing up for Web Hosting, and purchasing the domain at that time. You can then purchase an SSL from your Account Management Panel (AMP). I found this on the Official Drupal page on Changing Base URL. How do you get the ssl certificate from the cpanel? I purchased it before, but cannot find it now. If you have purchased an SSL via the AMP, it will be installed by our team. It is installed on the server and it not able to be acccessed via the cPanel. It would require root access to get to it. How to add comodo logo in oscommerce? Please see our guide titled "How do I show the secure seal for my site?" Typically, people will place the files they want to keep secured in a separate folder. From there, they can simply force that folder to SSL. If you have the pages in the general population, then you will need to create redirects for each specific page, just have it redirect to itself, but with the https protocol in front to force the SSL. As for the lock appearing, each browser displays that differently, but for it to show up, all elements of the page must be set in the https protocol. If even a single one is not, then the lock will not appear or it will appear with a warning icon over it. (1) Is it possible to set up an SSL certificate for one of the add-on domains on a shared server, so that one can use the URI like https://www.MyAddOnDomain.com/any_contents ? (2) If so, how much is the handling fee? If one uses the third-party SSL certificate, is it $25 SSL install fee (one-time) and $24/year for the IP address? (3) If so, and once set up so, when I want to use the SSL certificate for my primary domain or other add-on domains later, what will the URI be like? I take it can't be the primary domain, unless I purchase another SSL certificate for it. But will it be https://www.MyAddOnDomain.com/any_contents or like https://secure30.inmotionhosting.com/~userna1 ? Yes, if you want to use a 3rd party SSL, it is a $25 SSL install fee (one-time) and $24/year for the IP address. You may only have one SSL certificate valid per cPanel account. Thank you John-Paul for your reply! (1) and (2) are clear to me now! As for (3), to clarify, "one SSL certificate valid per cPanel account" means the contents of the other add-on domains (or primary) can be accessed (once the SSL for the MyAddOnDomain.com is enabled) via https://www.MyAddOnDomain.com/SubDirectory/something (providing SubDirectory is for the domain) and NOT like via https://secure30.inmotionhosting.com/~userna1/SomethingElse - correct? That is correct, as long as the SSL is for the Primary domain, you can access the full contents of the public_html via SSL. QUOTE: You may only have one SSL certificate valid per cPanel account. QUOTE: As long as the SSL is for the Primary domain, you can access the full contents of the public_html via SSL. I have a shared business account. If only one SSL Certificate is allowed per cPanel Account, how would you SSL protect your other websites/domains - which are stored in separate directories at the home directory, not public_html? JohnPaul is partially right. However, to see if you are able to have multiple SSLs within the same cPanel, you'll need to reach out to Support so they can review your account. If I ask a client to upload a PDF to a site after they've filled it out, is it secure? Thank you for your question. The PDF will only be secure if it is uploaded to a private folder, or one that is inaccessible to the world. For example, Do Not upload the PDF file anywhere in the public_html folder, unless it is password protected. Also to protect the file during the tranfer, ensure they are using the SFTP option. I previously purchased my ssl certificate through another hosting company. Now I'm purchasing through inmotion hosting. When I get to the whois info in the steps, do I need to change the info there? If so, what do I change it to? Thank you for your question. We recently made changes to this requirement, and you no longer have to remove privacy, or adjust your Whois. The main requirement is that the information in Step 4 is valid for the the person/business requesting the SSL. The instructions privided on this page for a dedicated SSL certificate state that you need to remove domain privacy. Since I do want domain privacy I wanted to know if you can add the domain privacy after SSL certificate has been installed or you need to remove domain privacy for as long as you have your dedicated SSL certificate. You could re-add domain privacy after the SSL certificate has been issued, however, Comodo issues the SSL certificates and could potentially revoke it if it does not meet their requirements of showing the owner's correct information within the domain. Can you add domain privacy after a dedicated SSL certificate has been installed? The domain privacy option has nothing to do with the SSL certificate, so you can add it whenever you are ready do so. You can always go to the Account Management Panel (AMP) to add privacy if your domain is registered through InMotion. If it is registered with a third party host, then you will need to go to your domain registrar in order to add the privacy option. Question: How to force website to use ssl? How do I get the padlock to show up even if just www.example.com is typed in? I just purchased SSL and this is a whole new world for me. You can force the SSL version of your site by adding a bit of code to your .htaccess file. Our article on forcing SSL will help you. So I purchase an SSL from you guys and it is in my file manager today but it is not showing as secure https quite yet, not using CMS, and when I force https in my htaccess it just gives me a message'your connection is not private'. What are my next steps? Hello David, sorry for the problem with the SSL certificate. We would need to have more information about your account and what you are configuring to use the certificate in order to investigate the issue. Can you provide us more information about your account and any steps you've taken to try to get the certificate working, please. Once we have that info, we can look into the issue further. Question: How to tell if SSL is installed? This is going to be a dumb question, but here we go. How can tell if my SSL has been installed other than the confirmation email that i receive. I am new to this world so sorry for being a newby. It is the last step for our site going live and I am trying to figure all this out. That's actually a great question that isn't touched on in this guide! To confirm your SSL certificate is live and running on your website, you'll want to go check it out yourself in your web-browser. If you can access the site over https that alone shows a SSL certificate is in play as it's required for the connection to work. Otherwise the Hypertext Transport Protocol wouldn't be making a Secure connection. Your web-browser should also show a Padlock closed icon to indicate your connect to the website is secure. If you click on that Padlock icon, you should be able to see information for the SSL certificate used, and if you see your website's name on it and it says verified then you are good to go. That's what's great about SSL certificates, anybody can see it on your site and know any data transmitted to or from your site can't be intercepted and read by others. Hope that was helpful, let us know if you're not seeing this on your site. You can respond back with your website address and we can remove it from your comment before approving it for the public if you'd like us to take a look. I have purchased an SSL for my website and received the installation confirmation mail. I don't seed the padlock icon and security information though. Thank you for your question. After your SSL has been installed, you will most likely have to update your website URL. For example from http://domain.com to https://domain.com. Are you using a CMS such as WordPress, Joomla, or Drupal, etc.? This information will allow us to provide a more detailed response, specific to your site. I purchased my SSL Certificate though inmotion. However when I visit my site there is a exclamation icon next my url not the padlock. THe information provided when clicked says "This website does not supply ownership information". How can I correct this issue? Sorry to hear about the problem with your certificate. Can you please provide the URL so that we can check it? We need more information if we are to troubleshoot the problem. Provide us the domain name in question and we can identify if there is an issue. I purchased by SSL vert from 3rd Party & i have submitted the Zip file already still i see SSL is not working , can you please look into this issue . Setup payment & IP done already . Hello, I got an SSL certificate installed but I am not having the padlock show up. I'm currently using a Wordpress CMS. Where would I go in order to change the URL? Thank you for your question. Please see our walk-through guide on How to Enable https (SSL) in WordPress. I followed the directions above to cancel the SSL, but I want to cancel it effective today, not when it is set to expire. Is there a way to remove it now? SSLs are files that have an expiration date on them for the server to read. Once installed, it will function for a year. Even if you cancel it in the AMP, the server files do not change. There are no refunds allowd from the SSL provider after 30 days. If it has not yet been 30 days, you can contact our Live Support to ask for a refund. Is a dedicated IP required for a private SSL with a specific domain name? Yes, a dedicated IP address for the cPanel account is required for SSL on a domain name. A cPanel account can only have one dedicated IP address and one SSL attached to it. Is Dedicated IP still required since SNI should be available on all servers? If so, why is SNI not enabled? Question: SSL certificate solve phishing warning? People tell me my site generates a phishing warning. Will an ssl certificate solve that even though I'm on a shared server and have three sites? An SSL will not help if Google has flagged your site for phishing, they simply encrypt the connection between a web server (host) and a web browser (client). Here is a link to Google's official guide on what to do if you think your site is infected. If it is not infected, you can report an incorrect Phishing message to Google here. Question: Expired SSL warning even after new ssl installed? I installed anew SSL last week and my email users are still getting dire warnings not to enter because the SSL is expired. How do i fix this? Thanks for your question. You must install the Service SSL's in WHM for the POP/IMAP to also be secure. This official cPanel guide on how to Manage Service SSL Certificates explains in more detail. I double-checked and it looks like things should be working for you now. I had to re-add the SSL certificate in WHM in the Manage Service SSL Certificates section. It looks like the ones that had been in place were self-signed ones probably created at an earlier time, so that's why the SSL error was showing in your browser. Please let us know if you're still having any issues at all. Thanks for doing that. Yes, it kept reverting back to an expired cert. Now my users see "
Never mind, seems to be working now. Jacob, John Paul and I discussed this earlier and Jacob identified and resolved the issue. I'm glad to hear that it's working! Please let us know if you have any further questions or comments! Question: Which type of Comodo SSL certificate? What type of Comodo SSL certificates are you selling? Comodo InstantSSL or different one? And one more question: if I want to use Comodo Free SSL Certificate before buying paid one do I need to pay any commision or I can do everything without fee? Hello Vitaly, and thanks for your question. We use the Comodo SSL Certificate when customers purchase a certificate through us. There is a one-time $25 SSL install fee, and it would be $24/year for the dedicated IP address required to host a 3rd party SSL certificate on your account if you'd like to provide your own. Please let us know if you had any other questions at all. I'd like to knoe the answer to this question too. Is your comodo ssl the PositiveSSL, the EssentialSSL, the InstantSSL. Is both domain and organization validation available, or just domain? We used to use the InstantSSL, but now use the ComodoSSL. The difference being in the way it validates. We no longer have to force people to remove domain privacy to validate. In this way validation is done by domain. When using Domains By Proxy, why do you require our personal information in the CSR? What does this match against? Isn't this the difference between organization validation vs. simple domain validation? Thank you for your question. Since an SSL is certifying your identity with a security company, it is standard to require a valid person or business listed in the CSR. This is because the information in the CSR is what is actually encrypted in the SSL. You said you no longer have to force people to remove privacy but your instructions still SPECIFICALLY say we must remove privacy to place the order. Thanks for pointing it out. I have since updated the instructions so that they no longer include the domain privacy. Your instructions no longer state that domain privacy must be removed to place an order but step 4 says "Note that Comodo will check the information you submit against the information given in a WHOIS lookup, and it must match." Does this mean we submit the information given by the WHOIS lookup even if they are privacy values? Does this also mean that privacy must remain on this domain to continue to use the SSL certificate? Thank you for your question about ordering an SSL. Comodo no longer checks against your WHOIS information, but does require that you use correct information in your SSL request. Privacy can remain on your domain's WHOIS record. I updated the article to say "Enter valid contact information for the owner, or business the SSL certificate is for." Really, I just purchased an SSL cert yesterday through InMotion, and two days later I'm still waiting for it to be activated. Why? Because InMotion had to deactivated my domain privacy, that I pay for separately, in order to get the certificate activated. And I'm still waiting on my cert. to be activated...! I checked and your SSL has been installed and is indeed working. As to the question on Comodo checking the data. There are different ways to verify an SSl prior to issue, though we do not normally use the method that requires the privacy data to be removed. We try to use different methods as this made the process take longer. Now that you have the SSL installed, you can have the privacy information restored. If I just upgraded from a shared cPanel to VPS plan will I need a dedicated SSL certificate for the cPanel or does it come with one? Now when I login it the SSL certificate throws an error and I exported and imported it into Microsoft's Trusted Root Certificate Authorities MMC. Any help? A VPS doesn't come with a dedicated SSL certificate by default. However, you can install SSL certificates with the cPanel SSL/TLS Manager. You could either generate a self-signed cert for your VPS hostname to use for encrypting data, but it would have self-signed warnings in a web-browser. Or you can purchase a SSL certificate if you wanted to avoid the self-signed certificate warnings. Question: Certificate good for all sites on server? i have 7 sites on my server, i would just like to double check i am buying certificat for the server, which means for all sites will have a certificate? If you just purchased a certificate for your server, such as vpsABC.inmotionhosting.com, you could secure all of your domains using that certificate as a Shared SSL certificate. If you wanted each full domain name secured separately, then a separate SSL certificate and dedicated IP address would be needed for each. Thanks for the comment, and let us know if you had any other questions at all! I want to add SSL to my domain and all subdomains, so I will need a Wildcard SSL. Can I buy one from you, or do I have to get that from a third party? Thank you for your question. You would have to purchase the WildCard SSL from a 3rd party, since we do not offer them. Do you allow Wildcard SSLs on Shared Server (Business Class Hosting)? This is a "yes" and "no" answer. On servers (most of our newer servers) where SNI (Server Name Indicator) is enabled, the answer is yes. However, you would need to add a dedicated IP address to your subscription and all added domains using the WildCard certificate would use that IP. It can definitely be used on VPS or Dedicated server accounts. These account types can also support more than one IP address. I may be a bit confused. So, lets try this again. We have a dedicated server with 20-30 sites with unique domains on it. If I wanted SSL for them they would ALL need individual SSL's and IP's? How would that work when ALL of my sites have the same IP? This depends on a number of factors. In some cases, dedicated IPs may be required. I advise you submit a ticket to support so they can review your server and find the best option for you. Does InMotionHosting allow Multi-Domain SSL Certificates (not just Wildcard Certificates)? For example, the Comodo PositiveSSL Multi-Domain certificate allows you to secure up to 100 different domains (not just subdomains) in one SSL certificate. This would be great for when you have several websites in your account each with a different domain name. As per my earlier answer to you in regards to WildCard domains, the same applies here. Yes, as long as your server supports SNI. If you are on an account where SNI is not supported, you can request to be moved to a server where it is supported, or you can upgrade to a VPS or dedicated server account. Also, the same limitation with the IP address remains. You are required to subscribe to at least ONE IP address when you are using an SSL certificate (regardless of the type). If the server my account is on has SNI (Server Name Indicator) is enabled, is it true that a dedicated IP address is no longer needed in order to get SSL for websites? This was information given to me by Adam Preiser of wpcrafter.com. Does each website on my shared business account have a separate c-panel? Or does my shared business acount (Pro Plan) have only one C-Panel for the entire account? Yes, with SNI you can install multiple SSL's within a single cPanel account. Shared/Business plans have a single cPanel for an account. You can addon additional domains, which will create a separate folder for storing the site files. We also offer Reseller, VPS and Dedicated Hosting plans that allow you to create separate cPanel accounts. Question: Do you configure my shopping cart for ssl? Hi i'm wondering if the $25 fee means that I provide you with the full URL of my shopping cart and you set it all up on the backend? I have nothing to do on my end? The SSL installation fee is simply the SSL installation on the server and does not affect the code of your site. This is something that you would need to change on your own. How difficult is this to do, i.e., configuring a shopping cart, site for an SSL? Is there a place to find step-by-step documentaiton for what needs to be completed. (I use WordPress with wooCommerce). I'm a beginner with websites so need to know what I'm getting into before moving forward! Thank you for contacting us. I looked in the WooCommerce documentation, and there is a Force SSL setting. This will enable the SSL on the "Checkout, Checkout -> Pay, (&) My Account" pages. Paid to have ssl on site. Could not find SSL certificate. In reading on your site that if there is anything less than VPS that I should contact you to install. If you purchase the SSL from us, we will install it for you. You will not have to perform the install yourself. Question: Invalid certificate messages when accessing email? I've donethe https://secure##....... but don't know where to go from here. Thanks for posting your comment. Can you provide me the exact steps you are taking so I can replicate your error? Also can you provide me with the exact error message? Are you trying to set up an email client to use the shared SSL? If so, you should not be including the https:// in the beginning of the path. this doesn't really tell you HOW to do anything. it's so unclear. is there anywhere that gives an indepth tutorial on it. What is the process for requesting an SSL Certificate? It is a bit vague, but if you have any specific questions, feel free to ask and we'll be more than happy to assist. Hi, how do I use a shared SSL certificate on an addon domain? Is it possible? It appears you got this one resolved. If you need any further assistance however with using your shared ssl certificate, or if you have questions on how to get / use a dedicated ssl certificate, please let us know! Can I share my SSL certification with my other two add-on domains? If possible how do i do it? You would have to purchase a multiple domain SSL from a 3rd party, since this is not something we offer at this time. Alternately, you could purchase a separate SSL for each URL.